Following on from on their successful ‘Twin Tone’ lampshades and ‘Twin Tone’ cushion collections, British homeware brand Lane have now introduced ‘Twin Tone’ Wall Art. 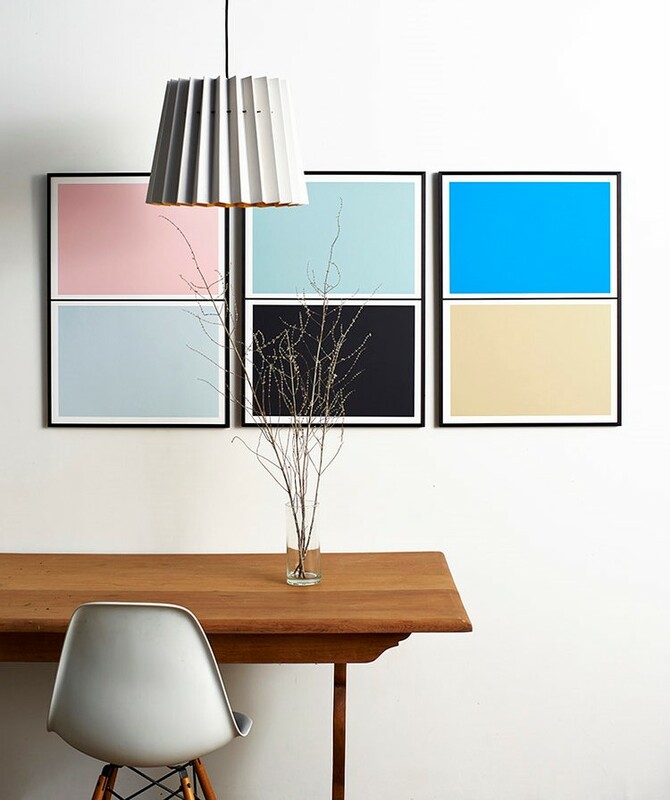 The new ‘Twin Tone Play’ Screen Print System consist of eight minimalist screen prints of two colour blocks and can be hung in any combination. Lane aim to use local manufacturers for all of their processes. The collections are designed by Joff and Ollie in their studio in Nottingham, they are then then hand screen printed nearby by expert craftsmen onto GF Smith’s beautiful, textured paper made by James Cropper, one of the oldest and last remaining speciality paper makers, based in the Lake District. The options range from subtle pairings such as ‘Granite Pink’ and ‘Drift Blue’ through to bolder options like ‘Mariana Blue’ and ‘Yuzu Yellow’, and work brilliantly with both neutral and vibrant schemes. The prints were inspired by paint sample cards and provide a playful way to inject a splash of colour into a room. Lane offer the prints as sets of two, three and four in carefully chosen colourways which, for interior design beginners, solve the problem of choosing the right colour combinations. For those with a more expert eye, the ‘Twin Tone Play’ prints give you plenty of options to compliment or define a colour scheme without you having to pick up a paintbrush. It eliminates the endless debate about samples and paint chips. Add and remove prints or move them to different rooms as your house changes to your needs. These minimalist colour blocks make a room feel calm, clutter-free and will create a focal point as brave or as subtle as needed. They are ideal for those who want to make a bright, bold statement and for those who want a more neutral home.